New & Used Metal Industrial Shelves / Open & Closed Commercial Steel Shelving Units, Made In The USA! Easy Rack is an established shelving company that manufacturers quality, made in the USA new and used industrial metal shelving products. We are proud to offer quality Industrial metal shelves as well as Widespan Industrial Shelving units. Our metal shelving comes in different gauges of steel. The thicker the gauge the more weight an industrial shelf can hold. Easy Rack makes shelving from 20 gauge and 12 gauge steel. the Class 0 is made from 20 gauge prime cold rolled steel and the Class I is made from the same rolled steel but is 18 gauge. Both are iron phosphated then painted with a baked on enamel. The Class I-A industrial shelving has an added 12 gauge angle bar 1 1/2" x 1' in the front flange. This added front adds strength to the shelving unit allowing for climbing or rough handling. The Class II has front and back 1 1/2" x 1" reinforcement made of 12 gauge steel. This gives the shelf greater load capacity. Class III has the same front rear and back reinforcements as the class II however an additional reinforced steel hat section is welded under the entire length of the shelf. Industrial Shelving is available in a large variety of sizes as well as open and closed back shelving units. Weight capacity on units can vary from 450 pound up too 2000 pounds. Industrial Shelving is made up of several components: Post, End Sheets, Back Sheets, End Braces, Back Braces, Shelf Dividers, Full Length Dividers, Bin Front, Shelf Reinforcements. Shelf Clips, Base Strips, Angle Corner Braces or Gussets and Pos Slice plates. Open Industrial Commercial Steel Shelving units are available in 5 , 6, 7 , 8, 9 and 10 Shelf units. The Sizes of the units vary from 36X12X85 to 48X36X85. Open Shelving Units are a great way to organize your office space as well as a warehouse space. It is important that you choose the right shelving to do the Job. Don't be fooled by cheaply made units like the ones you will find at Home Depot. They are cheaper but also much weaker then our units. If you need a serious industrial shelf that is made in the USA by quality craftsman that have been manufacturing industrial metal shelving then Easy Rack is the way to go. Closed Shelving units are also available. We currently offer 5, 6, 7, 8, 9, and 10 shelf units. Available sizes are 36X12X85 to 48X36X85. Widespan Commercial- Industrial Shelving units are very useful for storing larger items in a warehouse. This type of shelving is quite sturdy and can handle heavier loads. All the material used in Widespan units is treated with iron phosphate which is then painted with a baked on enamel. These units are available in 3 to 6 levels and sizes vary from 36X12X84 to 96X48X84. For details on exact sizes please visit our online catalog and find the right size to fit your needs. Widespan shelving units are usually decked with 5/8 particle board. We can supply you with the particle board or you may find it locally if you like. We can have any of our units shipped directly to your door saving you the need to pick up and deliver them yourself. Choosing the right commercial storage racks for your facility will allow you to maximize your warehouse space down to the last square foot. Many facilities invest in only basic racking systems, feeling confident that as long as weight capacities are not exceeded, their storage needs are met. These shelving systems are designed to convert the maximum amount of vertical and horizontal cube space into usable, efficiently organized storage space. Warehouse shelving will change this horizontal and vertical space accordingly into highly organized compartments of efficiency. Products and supplies can then be organized and stored by category, type, size, or material build. Rack Shelving converts floor space, walls, and portions of the vertical cube into organized storage space. Shelving racks are made from the highest commercial grade steel and are available in all sizes and industrial strengths. Indu strial Shelving. Industrial shelves come in all sizes, design builds, and weight capacities to fully accommodate the many environments found in the typical factory, warehouse, or services center. Steel shelving converts interior walls and large sections of the vertical cube into consolidated, safe, efficient storage space. The space consolidation this brings to organizations facing an impending move is often all that is needed to cancel that move and save an enormous amount of money. Storage shelving helps companies consolidated unused space into valuable storage and organization space. Simply by making it easier to retrieve materials, process flow often speeds up and companies find themselves able to complete projects during business hours. Shelving units. 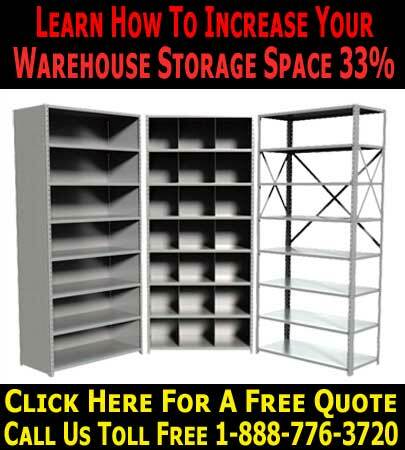 New & used heavy duty shelves made in the USA offer companies a highly efficient means of organizing products and materials. Improved organization tends to streamline process flow and reduce the amount of time it takes to get tasks accomplished. Each custom shelving system is made in the USA and shipped directly to your site where Easy Rack specialists install and test the systems before use. Steel Warehouse Shelving will transform floor space along interior walls and large sections of your vertical cube from wasted space into efficient, organized, reliable storage space. By using specially designed commercial shelving units, you can keep items in a proper order throughout the warehouse, and make it easy to find things that you are looking for. Metal shelving offers a number of benefits over commercial shelving units made from other materials. Over long periods of time, wooden shelf & shelves can be subject to moisture rot and mold in extremely humid climates. Used commercial shelving offers the immediate, tangible benefit of savings that approximate 20% on the average in comparison to new equipment procurement costs. New & Used Pallet Racks Shelving. Proper installation of pallet rack shelving is always a custom job that must be carried out to the specifications set out by the building, and also the local environment in which the shelving is likely to be used. Used industrial shelving comes in a huge variety of different designs and sizes from small units through to much larger integrated shelf systems. If you are facing a shortage of space in your plant and have considered the possibility of either relocating or building a new facility, consider the benefits that mezzanine system shelving offer as a cost-effective and highly efficient alternative. Steel rivet shelving on average are the most cost effective of your commercial shelving options. Rivet racks provide open access from all sides and there are no braces to obstruct storage. Shelving Systems enables storage of non palletized bulky or longer than usual material by allowing greater distances between supporting uprights. We stock a variety of industrial steel shelving systems that are easy to adjust, versatile, flexible, durable and high weight capacity. Easy Rack manufactures quality grade steel warehouse shelving units that is made in USA, durable, safe and the most dependable shelving units available in the industry. There is no better material for longspan shelving units and boltless long span shelving systems than 24 gauge steel. Wide span shelving units offer the strength, stability, and quality unmatched by other materials such as plastic, wood, aluminum, and other metals.